A one-day intensive course of Personal Branding for Career Growth held by Cristina Muntean, advisor, trainer and coach of strategic communication skills and personal development. Are you looking for a career change or maybe just for a new impulse to boost the value of your name in your company? 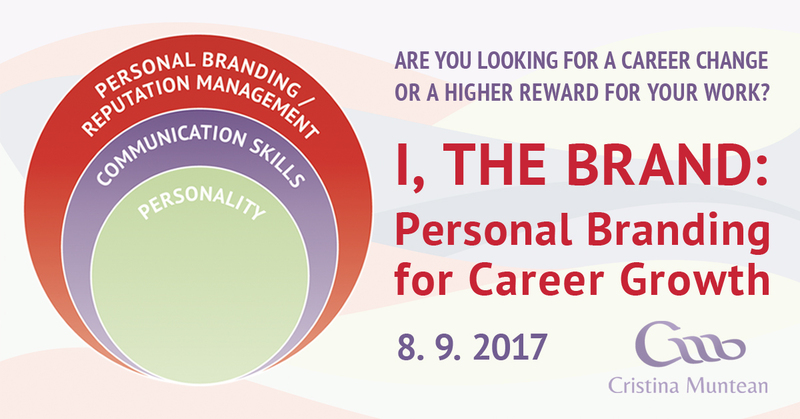 If so, join Cristina for this one-day intensive training in Personal Branding for Career Growth. The seminar aims to provide you with an integrated communications system for individual purposes that is time-efficient, easy to handle and powered to transform your name into a personal brand that is well known, well respected and fully aligned with whom you are and what you want to achieve in your work and life. A Personal Branding toolkit that, when nurtured, is prone to take your career to the next level. Managers envisaging a return to work after a longer break (maternity leave, sabbatical etc.). Pricing: 10% discount from the regular price for registered AmCham members. Information about the event in Czech language can be found here.